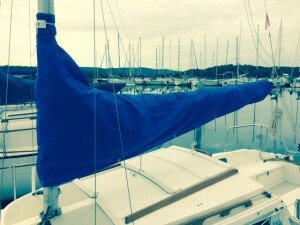 Mainsail covers provide protection for mainsails against the elements. 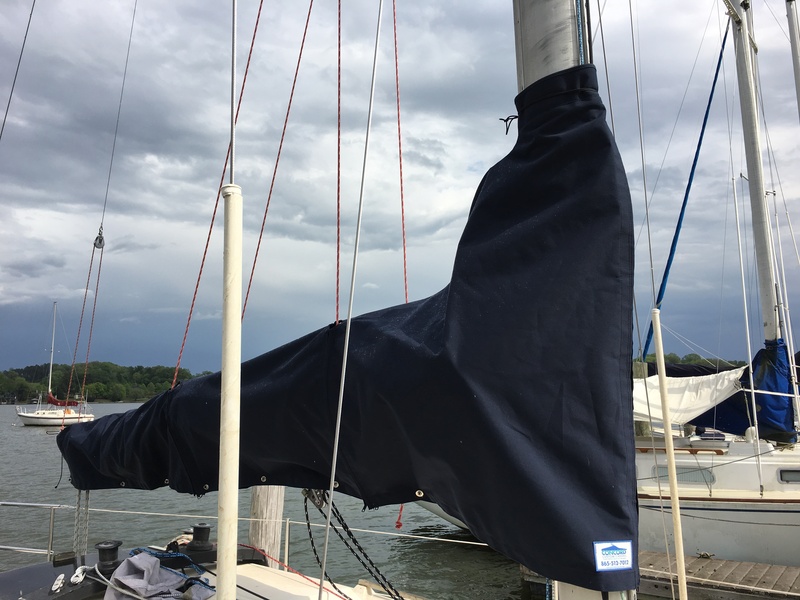 These covers typically have either twist lock or zipper closures at the mast along with a collar to seal the top of the cover around the mast. The foot of the cover is reinforced with dacron tape and is closed with twist lock fasteners. The boom end of the cover usually receives a grommet and a length of lashing line to attach the cover to the boom end. If your boat has lazy jacks, we can incorporate holes in the cover that accomodate the lazy jack lines. Jibs stored on roller-furlings need protection from the sun and elements. We can apply Sunbrella or UV dacron to the sail to provide this protection. These projects are quoted based on the length of sail’s foot and leech. 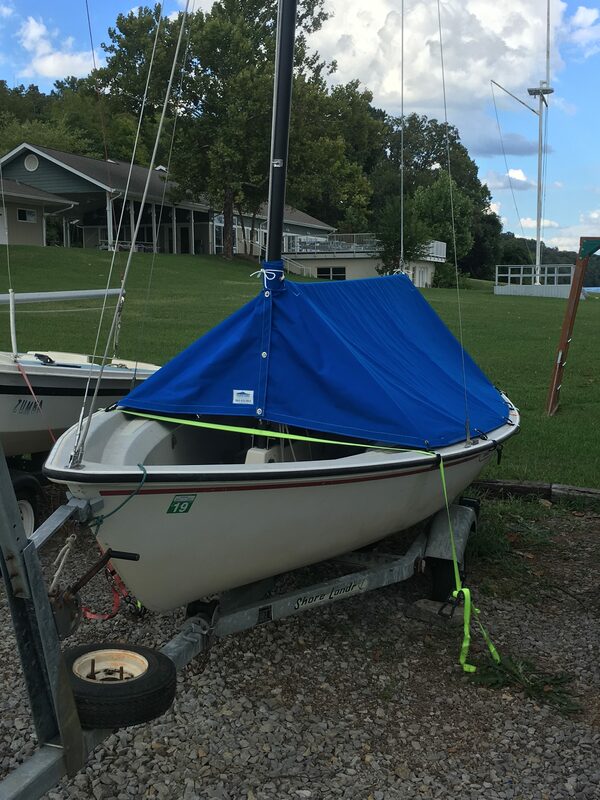 Sailboat Canvas – Jib Cover on a Melges 24. 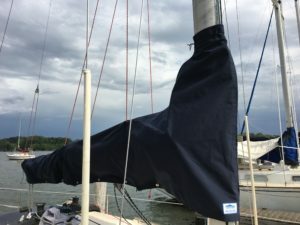 This cover can be removed easily and doesn’t weigh the jib down when sailing. Sailboat boom covers offer a rapid and simple way to cover a sailboat from sun and rain. 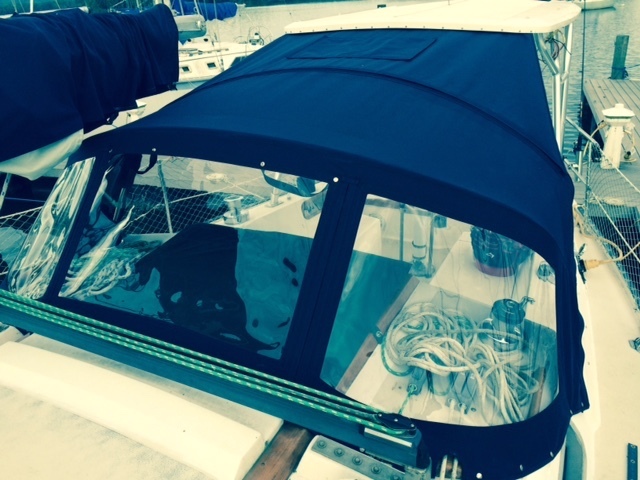 Click here for more information on sailboat boom covers. 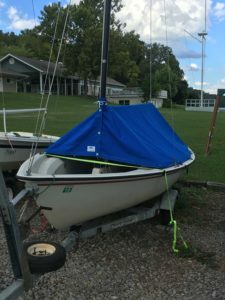 Custom boom cover for sailboat. 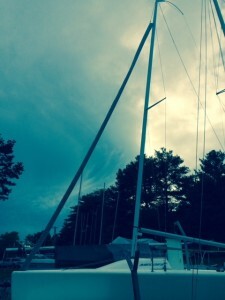 Sailbags protect jib sails that are left bent on the forestay. These bags feature a zipper closure and a D-ring for the halyard to prop the bag off of the boat’s deck. Tiller covers protect the boat’s tiller from rain and sun. These covers feature a grommet at the end along with a length of line for lashing the cover to tiller. The cover can be sized to accommodate a tiller extension that is left in place when the cover is installed. Winch covers keep moisture out of your winches to reduce maintenance, extend life and ensure their performance. These covers feature a bungee cord inner sleeve that hugs the winch drum to keep it where you want it. The outer sleeve and top protects the winch from rain. While Concord Custom Canvas offers Sailboat Canavas. However, Our canvas features Sunbrella or other exterior canvas. We can offer either UV Polyester or lifetime thread. Zipper pockets easy removal. Rain flaps fore and aft. Clear vinyl window with covering (optional). So, please Click here to see a selection of Sunbrella’s exterior canvas color options. Therefore, you should Contact us for more information today. Hence, Sunbrella or other exterior canvas is the best choice for marine canvas. As a result, your canvas project will last for many years. Click here to see a selection of Sunbrella’s exterior canvas color options. Contact us for more information. Sailboat canvas in Knoxville, TN.